The Overwatch Contenders Europe and North America Playoffs traveled to Alwernia, Poland, for a climactic finale this past weekend. Alvernia Planet played host to the excitement, an all-too-fitting venue given that it looks like a real-life version of the Horizon Lunar Colony map. The eight assembled teams had the perfect stage on which to battle, and they did not disappoint. Here’s a breakdown of some of the best moments from the weekend’s action. Live events are the crucible in which truly great players are forged. The bright lights of the stage, the roar of the crowd, the tension of meeting opponents face to face—there’s no doubt that the LAN experience is more intense than playing online, and some players wilt under the pressure. Seung-Jun “WhoRU” Lee is not one of them. Fusion University’s star DPS player spent his weekend proving that he had an even higher gear than what he displayed during the Contenders North America regular season. To the Overwatch esports faithful, that shouldn’t come as a shock: long before WhoRU was brutalizing supports in the backline of North America, he spent four seasons cutting his teeth in South Korea’s APEX tournament. Not only did WhoRU not wilt, he thrived, regularly unleashing Dragonblades as Genji and dropping Pulse Bombs as Tracer. While many would be satisfied with converting single eliminations off the back of those abilities, WhoRU routinely found ways to net multiple eliminations. When those abilities were down, the young ace had no issue having fun on the outskirts of fights, targeting vulnerable enemies. It's difficult for us to pick just one @whoru Ilios moment to highlight. Don’t misunderstand—Fusion University’s dominant run through the Contenders North America Semifinals didn’t begin and end with WhoRU. Philadelphia’s academy team showed up across the board. That said, there’s no denying that WhoRU was the brightest individual performer in Poland. Perhaps the most exciting thing is that he’s still got a bit of time before he’s eligible to be picked up by an Overwatch League team, and thus still has plenty of time to hone his craft before his near-inevitable ascension. The order of the weekend, especially early on in the Contenders Europe Semifinals, was the one-two punch of Zarya’s Graviton Surge into D.Va’s Self-Destruct. This powerful combo was the deciding factor in multiple large-scale altercations between the four assembled European teams. The combo has fallen off a bit in Overwatch League, but we’ll see what happens heading into Stage 4 and the Brigitte meta. While Team Gigantti entered the finals stage as the defending champions, they did so with a roster that was almost unrecognizable from last year’s. Only Tuomo “Davin” Leppanen remained from the 2017 lineup, the other six members scattered across various Overwatch League teams. 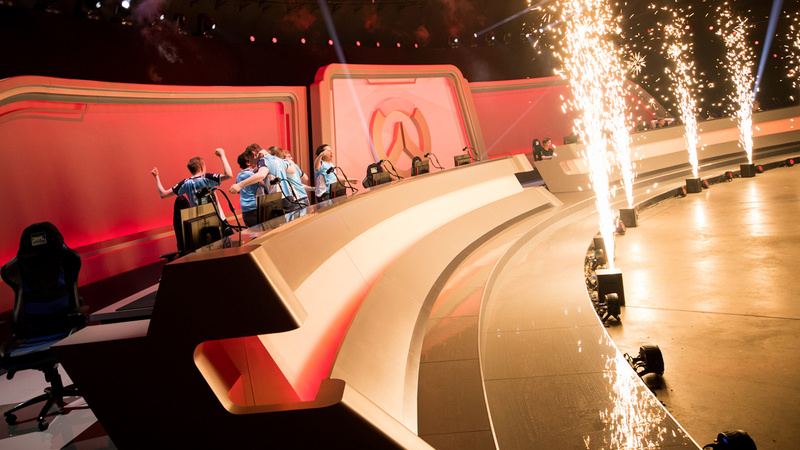 The personnel changes, coupled with an inconsistent regular season, made it difficult to envision a world where the Finnish team emerged victorious against London Spitfire’s academy team, the British Hurricane. The Hurricane entered the playoffs riding high off incredible hype. Their regular season matched expectations of dominance—and, apart from a strange run-in with Orgless and Hungry in week three, they were just that. Their matchup against Gigantti seemed appropriately set up: the old guard would pass the torch to the new in what seemed likely to be a straightforward affair. The series ended up being anything but. The best-of-seven went the distance, with both teams trading haymakers. In the end, in game seven, it all came down to Dorado, and even the final map swung back and forth multiple times. The Hurricane ended up taking the series on the back of a masterful defensive stand, but it was never a sure thing. The series between Gigantti and Hurricane was one of the best series of Overwatch we’ve seen in Contenders all season. It featured adaptation of strategies, flexibility in hero selection, and masterful plays at critical junctures, whether it was Daniel “FunnyAstro” Hathaway’s big boops as Lúcio, Richard “rCk” Kanerva’s incredible Self-Destructs, and more. If you missed out on the live broadcast, do yourself a favor and watch the VODs. The Contenders North America Semifinals featured a showdown between two Canadian teams, EnVision Esports and Toronto Esports. For most of the match, both teams were trying to eliminate each other by any means necessary, but there was a brief moment on Nepal: Sanctum where Canadian manners had their moment, and matters were decided by a good, old-fashioned Zenyatta Transcendence-off. Classic teamfight between two Canadian teams. No one gets hurt, and ownership of the point is decided via Transcendence dance-off. EU vs. NA is one of the cornerstone rivalries of esports, but it holds an especially dear place in the hearts of Overwatch fans familiar with the Atlantic Showdown. LAN tournaments are exciting due to a number of factors, chief among them the opportunity for the best of different regions to come together, meet face to face, and of course compete in exhibition matches. After earning top honors against their regional opponents, the Fusion University and British Hurricane took time to honor the tradition. It was a lighthearted affair that included top banter between members of the broadcast talent, some ambitious strategies by the teams, and some spirited Twitch chat memes. Fusion University brought out the tried-and-true North American dive composition, made possible by their stellar DPS duo of WhoRU and Zach “ZacharEEE” Lombardo. Europe responded with their trademark tank-heavy approach. In North America, quad tank is a bit of a running joke, but Europe gave them something to ponder on the plane ride home. If we do see more tank-heavy compositions coming out of Fusion University in Season 2 of Contenders North America, we’ll know who to attribute it to. To resolve the Atlantic Showdown, British Hurricane almost managed to secure a 3-0 score in the best of five, but Fusion University were able to put together a rout in Horizon: Lunar Colony to draw the series to a fourth map. It’s safe to assume both teams approached the exhibition match a bit less seriously than they did the rest of the weekend, but even so, it was plain to see that both of the teams had a lot of respect for each other and wanted to prove what they were capable of.